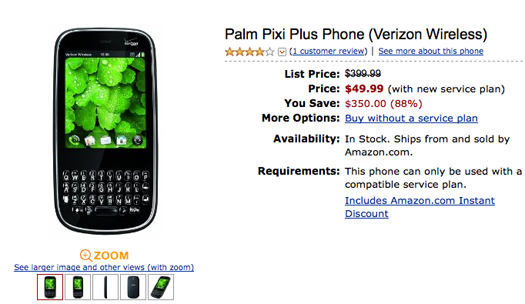 The new Palm Pixi (see our review) is now available at Amazon for just $24.99. This price requires a new 2-year agreement, but does not require any mail-in rebates. Considering the Palm Pixi as your next phone? This price will likely get most fence sitters off that fence. Amazon is now offering the Palm Pre for just $99.99 with a new 2-year agreement. Not only is this the lowest price we’ve seen, but it also does not require any sort of mail-in rebate.